Dr. Emil D. Kakkis, M.D., Ph.D., CEO and President of Ultragenyx discusses the recently FDA approved (April 2018) Crysvita® (burosumab-twza) for the treatment of X-linked hypophosphatemia (XLH), a rare skeletal disorder and Ultragenyx’s continued commitment to researching treatments for rare diseases like XLH. 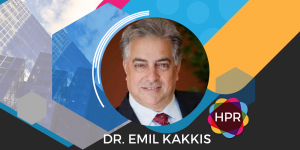 Guest Bio: Dr. Emil Kakkis is currently the Founder and Chief Executive Officer of Ultragenyx Pharmaceutical Inc., a biopharmaceutical company committed to the development of novel therapies for rare and ultra-rare diseases, based in Northern California. Dr. Kakkis has worked in rare diseases for 27 years as an academic professor, biotechnology and nonprofit foundations. He spent 11 years at BioMarin, in the role of Chief Medical Officer. In addition, Dr. Kakkis founded and is a current board member of the EveryLife Foundation for Rare Diseases, a non-profit organization dedicated to the acceleration of biotech innovation for rare diseases through practical and scientifically sound improvements to development strategies, regulatory policy and the law. Neal Howard: Hello and welcome to Health Professional Radio, I’m your host Neal Howard. Our guest today is Dr. Emil Kakkis, he’s going to talk about some recently FDA-approved Crysvita®. Thank you for taking the time today. Dr. Emil Kakkis: Neal, thank you for having me on the call. Neal: A bit of background about yourself. You’re an MD and a PhD? Dr Kakkis: Yes. I was in a medical scientist training program at UCLA, got an MD and PhD and I went and did clinical training in pediatrics and in medical genetics through a fellowship and through that additional training, ended up working on a treatment for a rare disease which led me ultimately to join biotechnology industry and to work on multiple rare disease treatments. Neal: Which rare disease are we talking about today in particular? Dr Kakkis: Today we’re talking about X-Linked hypophosphatemia, a rare genetic disorder, a phosphate metabolism and in these patients, they lose their phosphate in their urine and they’re unable to mineralize their bones correctly and as kids end up with rickets and bowing and as adults they end up with fractures and substantial pain and stiffness. And XLH disease affects about 12,000 patients in the United States. It affects all these patients as children but they grow up and they don’t die from the disease but they are severely disabled so it is a full spectrum of age both young and old affected with XLH. Neal: What was the traditional treatment or the traditional management for it? Dr Kakkis: Well the long time treatment for XLH has been the use of oral phosphate replacement therapy. Since these patients lose their phosphate in the urine, then the people believe they could give them oral phosphate and while you can do that, it tends to go right through these patients and right out but you can get a little bit of phosphate into the body of these patients and help some of their rickets but it’s not able to bring their phosphate to the normal level. In addition to phosphate, doctors had started to use active vitamin D supplements as well and the two in combination have become the standard of care for last the few decades but nothing new has come out until Crysvita® got approved. Neal: And how is Crysvita® administered? Dr Kakkis: Crysvita® is a subcutaneously injected monoclonal antibody and it actually acts by blocking a hormone that’s disregulated in XLH patients, essentially going after the underlying cause of disease and can bring their phosphates into the low normal range which will help mineralization of bone and a healing of bone disease in this disease. Neal: Now as recently as this has been approved and as rare is this condition is, what about the availability? I know you’re getting word out on shows like like mine today, what about availability in the coming few months? Dr Kakkis: Well we’re aware that tremendous urgency for patients who’ve been suffering this disease without any treatment and we have now a team of UltraCare liaisons in the field, 32 of them, they’re out talking to doctors about the availability of Crysvita®. Crysvita® is commercially available in the supply chain now and doctors can write prescriptions for it and obtain treatment for their patients. We have an extensive team in the UltraCare hub that help answer questions patients may have and help get prescriptions and authorization occurred for their in order to get on treatment. We intend then to have a very complete service in support of patients to make sure that things don’t get bogged down and that they can get treated as promptly as possible. And while the authorization process is going on in most patients, we can actually get them started on treatment even before the insurance is fully authorized to help make sure that they’re getting treated as promptly as they can. Neal: Have you seen any unique challenges with such a rare disease? Dr Kakkis: Some of the unique challenges are the fact that many doctors are not really as familiar with the disease or how it’s managed and that many of the patients may not be seeing a doctor who would normally be the one to prescribe the disease. For example, many adults with this rare disease are seeing doctors so their bone problems or their pain problems but they’re not seeing an endocrinologist who might prescribe the drug. And so because they’re not seeing the doctor who would actually be doing the treatment, it takes more time to find them and make them aware of the opportunity so we need to do a lot of things regarding education of physicians who are less familiar with X-Linked Hypophosphatemia or may know of it as an older term like vitamin D resistant rickets and to make it clear to them there are new ways of treating this and to help patients get referred into doctors who might be someone who could prescribe and manage a patient on Crysvita® therapy. Neal: Now where can patients and other healthcare providers go online and get some more information about Crysvita®? Dr Kakkis: Well they could go on our Ultragenyx website and find the Crysvita® or look up Crysvita® and be able to find the website, it’s already up and that should help them find the website both at the company or the product website to help them through the process of getting access. Neal: Is there anything else that you’d like to add that maybe I haven’t touched on about the XLH? Dr Kakkis: I think one thing that’s very important is for many rare disease patients that they’re very used to being ignored by the system and not being cared for, that no one wants to take the time. I think what Crysvita® now gives them opportunity to have a drug that’s been made specifically for them to take care of their particular problem and treat the underlying cause so it’s really an opportunity to change the course of the future of patients with XLH and an opportunity for patients to take charge of their health and to do something really important and profound about what’s been going on in their bodies. We look at that it’s an incredibly important responsibility for us as a company and how we make that available to patients that need something that we think could change their future. So we’re excited about the possibilities and we’re out doing everything we can to make people aware of the access and how to get it and what we can do to help them in that process. Neal: Well I appreciate you coming on the show today and giving us this information. Dr Kakkis: Well thank you Neal for having me.